Hello dudies, I am back! Did you miss me? I know you didn’t! How so as I’ve been pestering you with pictures on Instagram like crazy! Though I really like Instagram for some reasons the one big downside for a chatterbox like me is that you have to keep it simple and short. Because really, who the hell wants to read a novel on Instagram? But as I am not a person of simple and short (haha short I may be though) I do prefer the space I have here for indulging in talking shamelessly about myself. In the most sassy and humorous way I might add! So next to having been part of a few short moments of my vacation I thought it might be fun to invite you all to come travel with Stefan and me for one day! 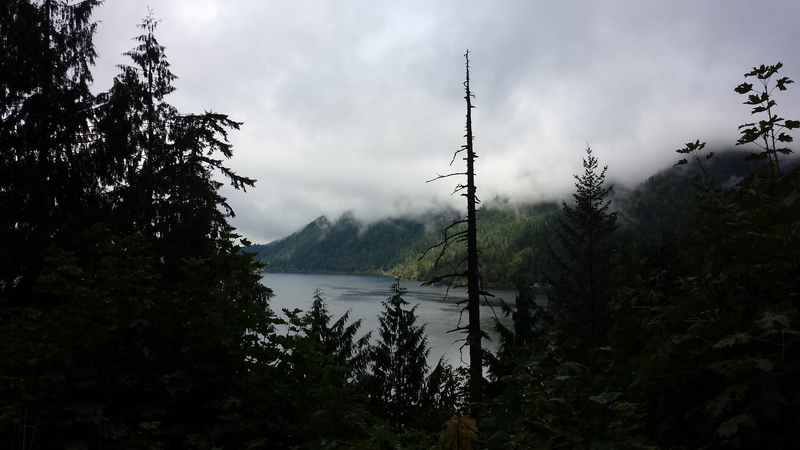 For this occasion I’ve picked a rather typical day we spent in the Olympic National Park area. Rather typical because it contained a great range of all the funny little quirks of us. Buckle up, travel with us and enjoy! 7.00 am – We get up. I’ve been awake for 40 minutes already, stalking everyone I like and also everyone I hate on social media and doing my usual morning stuff. Now I wake up Stefan the sleepy head and force him to get up. We pack up all our stuff. We brought way too much as always and so this takes a while. 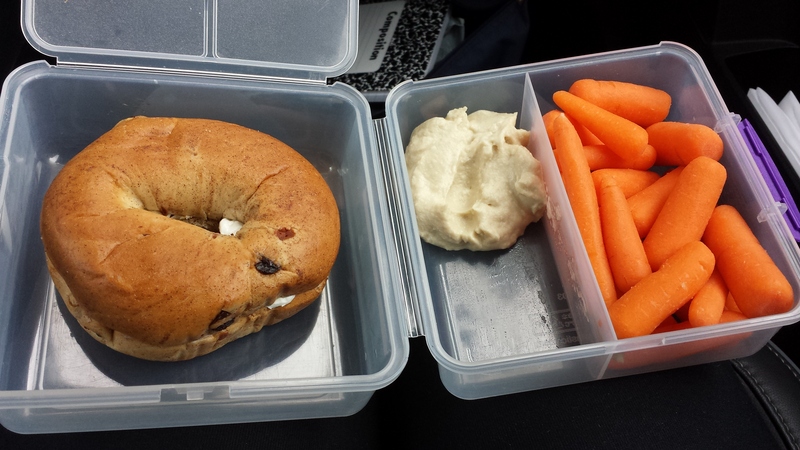 I make our lunch sandwiches (Cinnamon Bagel with Cream Cheese) and also pack carrots and hummus in our lunch boxes. 8.00 am – We have overnight oats with trail mix on the bed. Yes it’s as epic as it sounds. We check out of the Motel cram all the luggage in the car and drive the 5 minutes to Safeway where we intend to grab a coffee at Starbucks and hit the road for the Olympic National Park. 9.05 am – We arrive at Safeway and as I am a lazy bum and really don’t feel like walking at the moment I get me a grace period by suggesting to have the coffee at Safeway. 10.05 am – We leave Safeway after drinking coffee for 20 minutes and then spending 40 minutes on deciding which kind of snack we need for the day. After careful consideration Stefan chose Hershey’s Kisses and I settled for Lime Tortilla Chips and Guacamole. Yes this is a serious decision and can take up to 40 minutes. 10.05 – 11.15 am – Finally we are on the road. Stefan has to suffer through my three favorite songs again and again. We definitely have different patterns when we listen to music. He is more of the ‘I listen through the whole CD’ type of person whereas I play my favorites again and again and again. The drive is actually pretty short but we stop several times because the chocolate is in the trunk for the scenic view. 11.16 am – We arrive at the trailhead’s parking lot and I make a beeline for the toilet. 11.17 am – On my way back to the car I see EVERYONE packing up their food in bear containers. I am a chicken and get afraid of meeting a bear because of the irresistible smell of my cinnamon bagel and we decide to have an early lunch at the parking lot. 11.40 am – We’re fed, have peed and are all geared up to start the ‘Lovers Lane Trail’ as we realize we’re at the wrong trailhead. After a few minutes of staring at different maps and discussing who’s fault that is (yes we discuss though some people mistake it as arguing) we realize that after a short detour we get access to the trail and can walk it backwards. We settle for this alternative and off we go! 12.00 pm – We arrive at the picturesque end of the trail with a waterfall. We take a few pictures and then explore the vicinity. We have another discussion about the entry point of the trail and finally find the right path. 12.25 pm – We start hiking. 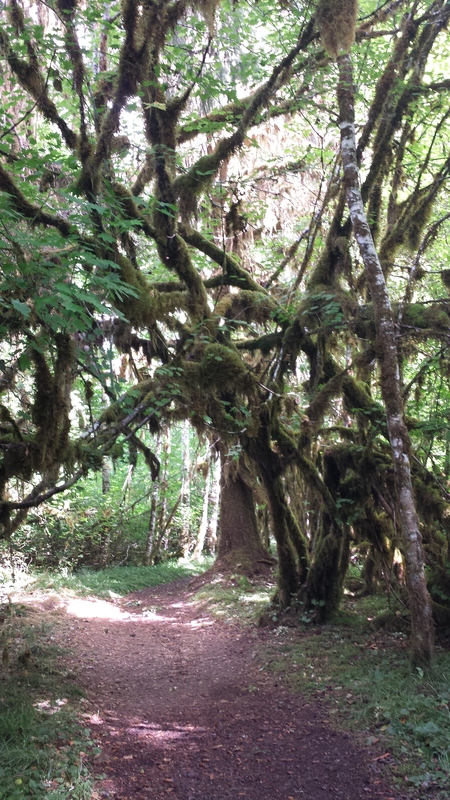 The trees are high and very mossy and the whole surrounding looks a bit unreal. The path is narrow and we can’t walk next to each other. I walk first and I walk fast. 12.35 pm – We meet a couple in their 50’s on the way and have a little chat. 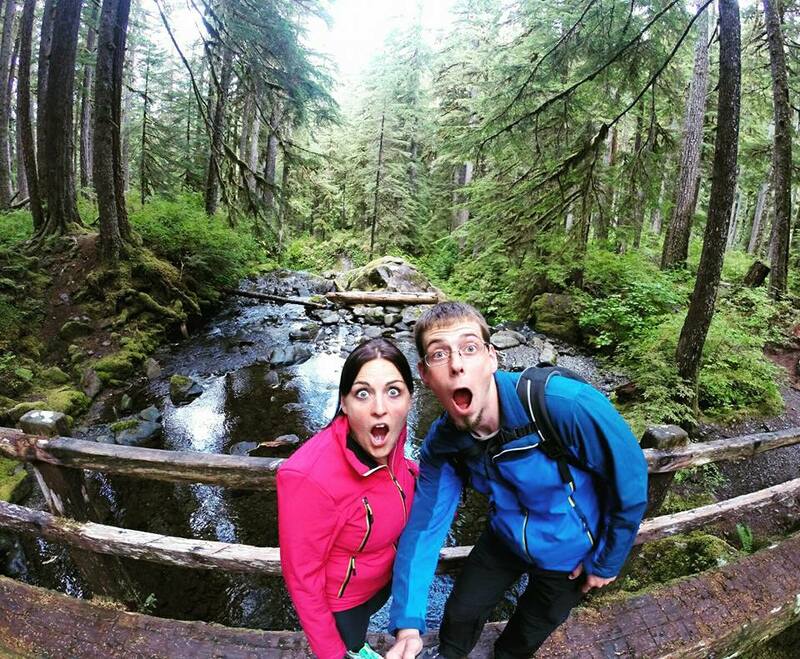 They ask us whether we plan to walk the whole Lovers Lane Trail and as we affirm they promise us a ‘stunning’, ‘breathtaking’ and ‘absolutely gorgeous’ hike. I start to look forward to the next 3 miles! 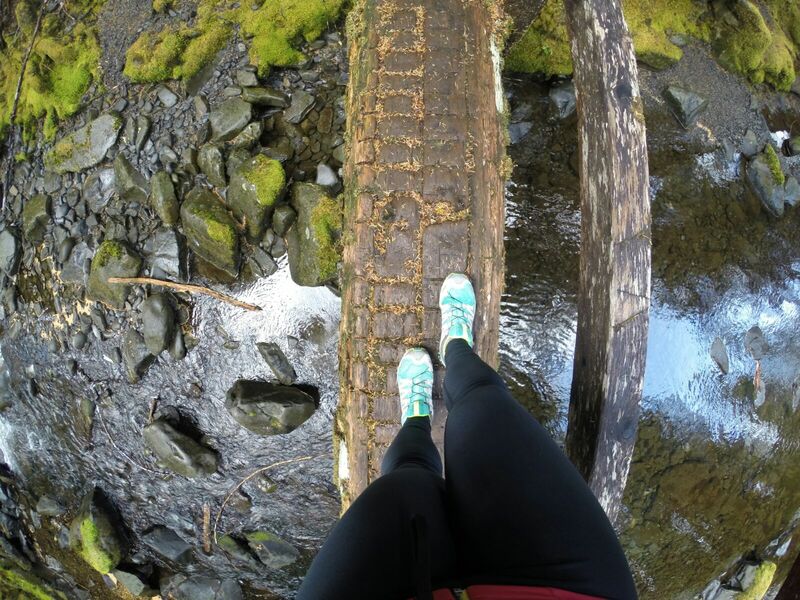 We walk over narrow bridges, goof around a little and get to see more moss but vainly wait for the surrounding to get ‘stunning’, ‘breathtaking’ and ‘absolutely gorgeous’! I feel pranked and sulk a little. But Stefan gets to cheer me up with some chocolate. The guy’s a keeper. I am pretty good at day dreaming so I spend some time within my own world and luckily after what feels like an eternity we arrive at the actual trailhead. 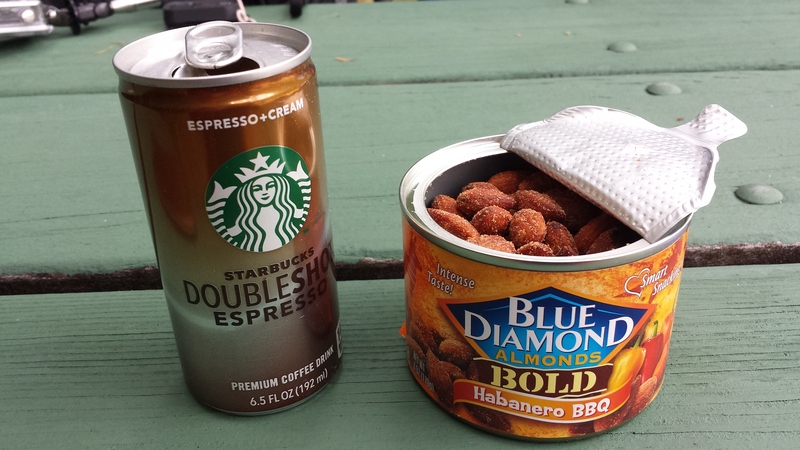 3.00 pm – We find a picnic bench and open our coffee and nuts. I realize that the double shot espresso contains milk and sulk again. Stefan offers to drink my coffee, too but I decline. First he surely can’t handle 4 shots of espresso and second he shouldn’t be forced to handle me without two espresso shots. So I drink the coffee and luckily the milk doesn’t bother me too much! At least not as much as the walk back to the car does. We decide to take the 1,5 miles route on the street and spare us the extra two miles through the woods. 3.45 pm – We arrive at the car right in time for the next beeline to the toilet. We eat our snacks and then hit the road to drive down to Forks. The sun shines and I sulk a little because we don’t get to see any Vampires. 5.00 pm – After checking in at the motel we check out the supermarket across the street and buy some beer. Then we drive to a gas station with a subway and get us dinner sandwiches. 6.00 pm – I feel deadbeat and inhale my sandwich. Then I curse myself for thinking 6 inch would be enough. I sulk again until I remember my tortillas and guac. 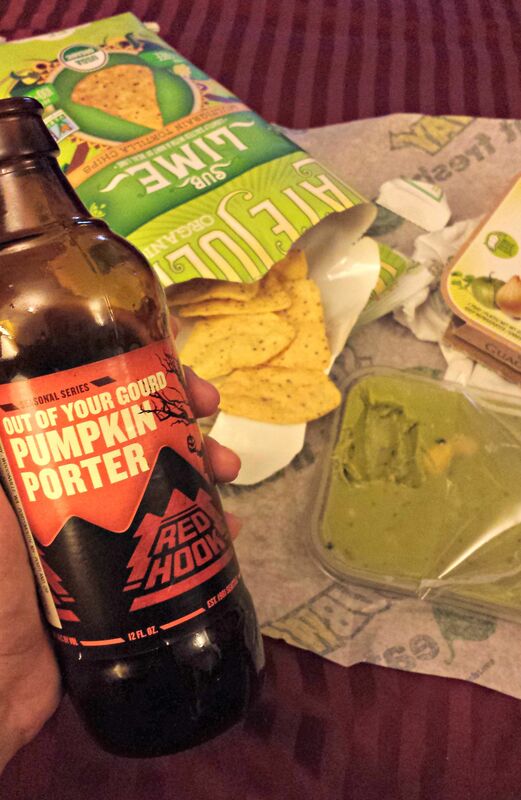 I inhale half a pack of chips and drink a pumpkin porter. I feel like Harry Potter until I realize that they drink butter beer and pumpkin juice. I proceed feeling like Harry Potter anyways. 7.00 pm – We flip through the pictures of the day and I chose to post the one where I look the least dumb on Instagram. Sadly it’s this one! 8.00 pm – We spend the rest of the evening with watching Friends and planning the next days – fruitlessly as we will find out the next morning when a bad storm hits the coast. At some point I fall asleep. As I like to travel even when this means to get stranded at Altlanta airport for 11h and also because I travel a lot and have a few epic things planned for the next years I decided to talk a little more about it on here. I’ve already planned a few fun posts including my top 10 and also my top 5 not so gracious moments of our trip for the next week. I’ve got some pretty epic places I want to show you with some recommendations how to tackle them, but I also won’t deny you some failures we faced during this trip. So far I am pretty letlagged but also glad to be back here (not so much back at work) and hope you enjoyed to spend the day with us! Loved reading this, your honesty in your writing is why I love you! I do like hiking and semi enjoy the journey but I will admit it revolves around when lunchtime is and looking at my watch to see when I can crack open my jerky. I also have been known to suggest going for a hike because it means I can buy a quest bar… #noshame! Jen, this is maybe the nicest compliment you could have made me! Thanks you so much. This means tons to me! omg I read your first post at breakfast and now this post at lunch and I can’t stop giggling. You are the best. So much sulking, so much awesomness. those silly people, I want to shake them and ask what their definition of picturesque is. Also….yes. Snack choices take FOREVER in another country, except Italy. there, you just pick which size nutella jar you want. Thank you dear :-* That means a lot to me! Seriously!